He is finally here, and we could not be happier. 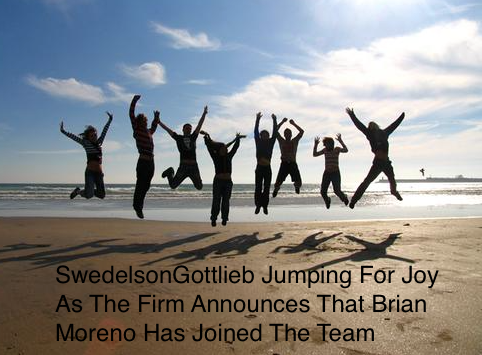 Brian Moreno, already a seasoned community association attorney, has decided to move on from the firm he worked with for the last six years and bring his experience, skills and excellent reputation to SwedelsonGottlieb. Brian enhances the firm’s team of lawyers and will certainly benefit the firm’s clients. Brian could have joined any of the other community association law firms, yet he chose SwedelsonGottlieb. That says a lot about Brian and SwedelsonGottlieb. Brian has extensive litigation and general corporate, real estate and community association legal experience. Follow this link to read Brian’s stellar resume. We hope you will have the opportunity to work with Brian.